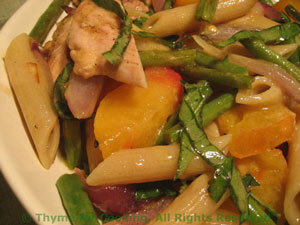 Easy Dinner: Turkey and Green Bean Pasta Salad, Weekly Menu Plan. This is a colorful pasta salad, quickly stir-fried. 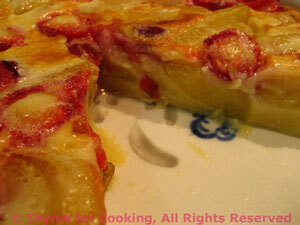 Clafoutis is, basically, a sweet popover pie.... Very easy. I used Heirloom Tomatoes in the salad, the yellow and red Ananas. Cook pasta according to package directions, drain, rinse lightly in cold water. Top and tail beans. Cut into 1" lengths (2.5cm). Cut turkey into bite-size pieces. Heat oil in a medium skillet. Add green beans and red onion, stir-fry 2 - 3 minutes, until just crisp-tender. Add turkey, stir-fry until lightly browned and cooked through. Remove and add to beans. Stir all to help cool a bit. Cut tomato into large chunks. Add a bit of vinaigrette to turkey, beans, onions, stir to combine. Add pasta, tomatoes, herbs and a bit more of the vinaigrette, stir gently and taste. Add more vinaigrette as desired. (I used it all.) Serve. 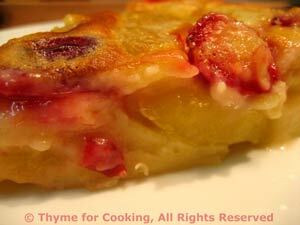 Pour batter over fruit and bake; time for 30 min.